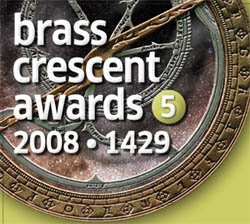 Afghan LORD has been nominated under the “BEST SOUTH ASIAN BLOG” category for the Fifth Annual Brass Crescent Awards in 2008. It would be great if you vote for your humble Afghan blogger. Please browse the Brass Crescent page and go to the bottom of the page, look at the second category from down, there you can find Afghan Lord, you have to click where to select the blog then go to the lowest page, enter your e-mail address, before you have to tick mark this option: "
I certify that I am only voting once for the Brass Crescent Awards". Finally click to submit your vote. Check your inbox, an approval will be send to your e-mail address with a link, in order to complete and your vote submitted please click on the link. Voting Directions: Use the form below to select one nominee from each category. We will ask you for your email address to confirm your vote, but don't worry - we will discard your email address after votes have been tallied. What is the Brass Crescent Awards?